The son of a Limerick orthopaedic surgeon, Brian Meehan had just eight horses in his charge when he set up his own training business in Lambourn in 1992. Before that, he had worked at the Irish National Stud, then taken on the role of assistant trainer to his good friend Richard Hannon for six years. He had intended to stay for a single year, believing training would be beyond him financially. 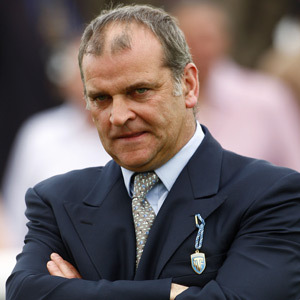 In 2006 he was headhunted by the Sangster Family to take over at Manton House Stables, which was established as one of Britain’s finest training centres in the late 1860s and which has a long history of producing Classic winners. Within three weeks of moving in, the Irishman saw David Junior win the Group 1 Dubai Duty Free and later in the year Red Rocks triumphed in the Breeders’ Cup Turf, a double which brought in prize money of £2.7 million and earned Meehan the title of ‘International Trainer of the Year’. Other Group 1 successes for Meehan include the Racing Post Trophy with Crowded House in 2008, the Prix Morny with Arcano in 2009 and the Breeders’ Cup Turf with Dangerous Midge in 2010. He enjoyed a first QIPCO British Champions Series success with Most Improved in the 2012 St James’s Palace Stakes at Royal Ascot.